I’ve seen many bits of compelling cruise news lately, so here’s a roundup of some items of interest for avid cruisers. 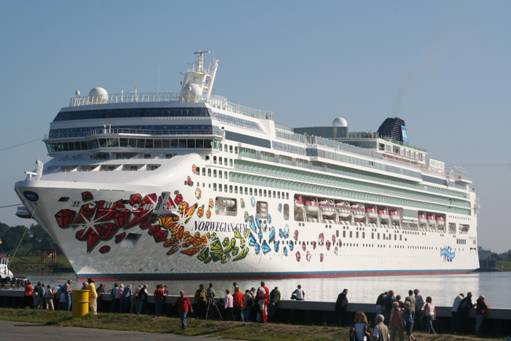 The Norwegian Gem left dry dock last week, and sea trials are planned for mid-September. When the ship joins the [% 12025 | | Norwegian %] fleet later this fall, the cruise line will become the youngest fleet in the industry. The Gem has all the bells and whistles of her Jewel-class sisters, such as a bowling alley, rock-climbing wall, extravagant suites, and a Nintendo Wii system in the atrium. [% 9823 | | Holland America %] is encouraging locals to cruise from San Diego this fall or winter with an offer of free parking. Guests who book cabins with an ocean view will receive complimentary parking near the San Diego terminal for the length of their cruise. The line’s cruise destinations from southern California include Mexico, Hawaii, and Tahiti. [% 9732 | | Cunard %] has added one more sailing to the QE2’s farewell season. The new eight-night cruise departs from Southampton on April 27, 2008, and will visit France, Spain, and Portugal. Starting prices range from $1,315 to $7,795, and staterooms are likely to sell out quickly. [% 11986 | | Carnival %] has announced new short itineraries out of Miami to start in fall 2008. The Carnival Imagination will offer three-night Bahamas cruises with an overnight in Nassau and four-night cruises to Key West and Cozumel. These year-round itineraries begin on September 22, 2008. The Carnival Destiny will start its new year-round four- and five-night cruises on September 27, 2008. Four-night sailings will call in Key West and Cozumel; five-night voyages departing on Mondays will visit Grand Turk, Half Moon Cay, and Nassau; and five-night cruises departing on Saturdays will visit Grand Cayman and Jamaica.